statesidewife | Memoirs, musings and general OMGWTF?! moments from our stint in the States. 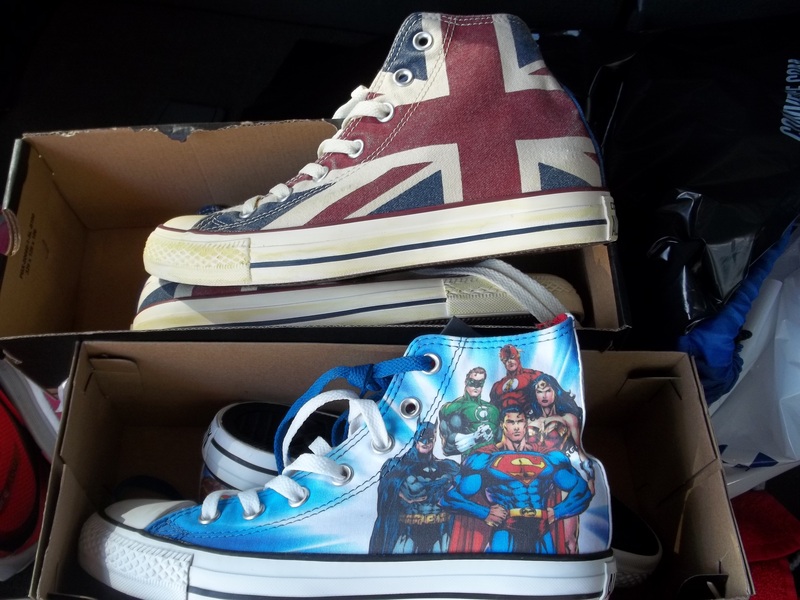 So which ones should I wear first? By the end of the afternoon we were slowly melting and wondering how we would cope with the same heat and humidity for a whole 13.1 miles the following morning. Even with a 7am start it was forecast to be 90% humidity and around 25c. For our evening meal we had been recommended a local restaurant, Food For Thought, which I have to say is probably the best restaurant I have eaten at in this country. The food choices for me were amazing, way more than the usual veggie lasagna/black bean burger/mac & cheese from the kids menu. I plumped for two vegan “chicken” breasts, one in a coriander and lime sauce and one in a spicy mango salsa, and it was spectacular. The staff were also brilliant, not only our server but also the manager who came to meet us and see what we thought of the place. Also, in case we ran out of conversation, they supply conversation cards on each table and thoughtful quotes dotted around the walls. Just perfection. Oh, and they gave us a 5% discount voucher for a return visit – like we need any persuasion! We then decamped to our Bates Motel for an early night, and it turned out to be pretty darn good, for $38 per night. I wouldn’t have wanted to stay there on my own, but I have to say it was clean, had two double beds in the room, and a working fridge for all the supplies we had brought with us, basically meeting all our needs for the one night. This didn’t mean I could sleep at all though. Stateside Husband was straight off to sleep while I laid down with my eyes shut, breathing slowly and trying to fool myself into sleeping. I figured that being motionless must at least count as rest somehow. After an hour I tried some relaxation techniques. Rather than counting sheep, I started listing Daniel Day Lewis films. I have no idea why I chose him, I don’t even know that I’ve seen any of his films, but I suppose that’s what happens when you’re tired. So my thought process went “Gangs of New York, My Left Foot, Michael-something-the-Irish-one, … Michael Collins? Or is that the Tom Hanks one about the astronaut? And was he in Harry Potter? No that was Ralph Fiennes. Has anyone ever seen them together in the same room?”. With the benefit of imdb.com I now know that the Irish film I was thinking of was actually In the Name of the Father, Michael Collins was another Irish film with Liam Neeson, and Tom Hanks played Jim Lovell in Apollo 13, so why was I thinking of him? Anyway, at some point I must have fallen asleep, because suddenly it was race day!!!! By 5.30am we were at the Dunkin Donuts drive-thru, amusingly behind a police car picking up the day’s doughnut rations. I love Dunkin, not least because they supplied us with buckets of coffee and some pretty good oatmeal, perfect pre-run fuel. When I started running as a hobby, I didn’t expect my new weekend activities to include sunrise car-park breakfasts and collecting safety pins, but these do now appear to be two of my most regular occupations, and this weekend was no exception. We managed to meet up with one of our running group buddies early on, and then with a second one at the start line. Both of them have run many half-marathons before so we didn’t run together as we all had different goal times in mind. The race kicked off, not only with the traditional national anthem but also with the Colonial Williamsburg fife and drum band, which was pretty special. Then I started my iPod and among the first few songs were Eye of the Tiger and The Final Countdown, so I knew it was going to be a good race. We had been warned, by every other runner and by the official guidance on the race website, that the course was a really hilly one, however I have to say that it really didn’t seem that bad to me. I think I had imagined it to be a lot worse and so the reality was a lot nicer/flatter than expected. There were some annoying slight uphills towards the end, one after the other, but none of the massive mountains for which I had been mentally preparing myself. We were also fortunate with the weather; it was hot and fairly humid but not quite as bad as expected and a lot of the course ran through shaded areas, including a long stretch through a park, so we escaped a lot of the sunshine. The course was really lovely as it not only wound through the aforesaid park but also through the centre of Colonial Williamsburg and some other rather picturesque streets, plus a stretch along a major road (where I suddenly realised I could get run over if I accidentally strayed a millimeter to the left of the tiny bollards) and all the traffic coming onto the road had to stop and wait for us, which is not something that happens for me every day. The best thing for me was that it was a completely unknown course so I never had any idea what was coming next nor could I visualise how much further I had to go, which is normally the killer for me. I didn’t experience any low point, amazingly, because even on a 5K run I usually get about three-quarters of the way through and get really grumpy. I enjoyed the whole thing, even managing to leap up and down a bit around the 9 mile mark when a particularly good song started playing (Damn Dog by Manic Street Preachers, in case you’re interested). I walked quickly through the water stops where I needed a drink, and some of the uphills were incredibly slow despite me working my hardest to power through them (which I found particularly amusing, clearly getting to the hysterical stage by then) but I’m pleased to say I didn’t stop at any point, except for a toilet stop but I never tired enough to need to just stop for a rest. Officially I finished 526th out of 1308 runners, 180th out of 705 women, and 29th out of 128 in my age group. Not bad for a first timer. It’s definitely time to take it easier for the summer, concentrating on shorter runs for a while before the next half marathon in November. But first it’s time for a well-earned pedicure!! So, some while back, I had the idea to run this ten mile race, and this was going to be my big one. Somewhere along the way, Stateside Husband convinced me (in a moment of weakness) that I should run a half-marathon and so the Valor Run became my ten-mile training run in the run-up to the half-marathon. Having run 100 miles during April (my highest ever monthly total), May’s mileage has been much lower, largely due to being away from home but also because I have been doing a few longer runs with more rest in between. So I embarked on a training run a few days before this race, thinking it would be nice and easy and just a little something to loosen me up. Well, for some reason it was one of the hardest runs I have ever done, only 7 miles and the overall pace wasn’t bad but it felt like such hard work, I assume because the heat and humidity has just suddenly crept up. Worst of all, I fell over one mile into the run, although I’m proud to say I got up and ran another 6 miles anyway. Best of all, despite it being early morning, I somehow managed NOT to fall over where there were lots of school kids waiting for their bus, so nobody saw me do it 🙂 I obviously have a tried and tested falling technique, because I managed to hurt exactly the same spots as last time (which was over a year ago) and got myself a large wound over the scar from last time. Well, I decided that this bad run meant that the race was likely to be epic. The weather on Sunday morning was pretty good, and we were racing on a trail through a State Park so it was all under the cover of trees which helped a lot. The first part was flattish so I made some good progress, but the second half was much more challenging, with some really steep, sandy, slippery parts, and I got a lot slower during this section. Half a mile from the end, I fell over, this time taking most of the skin off my shoulder, scraping my knees again, and getting a lot of dirt on my face but amazingly not actually injuring it. My dreams of being a professional knee model are, I think, pretty much dashed. However, I finished in a time of 1:47:46, putting me fifth in my age group. All the way round, I thought I was really slow, so I was pleased to find out that I was actually pretty consistent with everyone else, especially considering my fall and the fact that I’d never run that far before. There was also a 5K race, and my 10 mile pace was almost a minute faster than the winner of my age group in the 5K. Which made me slightly grumpy as I could’ve totally won that, but the main thing is, I did pretty well on that day as I think the heat got to everybody. …. is probably NOT cycling in the Everglades with alligators. But we did it anyway. We rented some bikes from a friendly Park Ranger, although that probably wouldn’t be my usual first stop for top-notch cycling equipment. In fact, just like our cycling trip to the Outer Banks some while back, it wasn’t so much a bicycle as a very comfy old armchair on wheels. With no gears and no brakes. Not necessarily the best equipment for a fast getaway. However, Shark Valley is a very flat, traffic-free (apart from the occasional tram and much more frequent alligator) environment, so in fact the cycling aspect was pretty easy, despite the heat and humidity, and the two hours it took really did seem to fly by in about half that time. We arrived at 8.30, park opening time, in order to beat the heat as much as we could. It was “only” about 26c at this time so it was the best we could hope for. We also had our arms and legs fully covered in an attempt to avoid the mosquitoes, which added to the heat for us. This ploy did mostly work as I only ended up with a couple of bites, which is amazing for me who is normally regarded as a buffet table by the mozzies. There were two other cyclists who set off just ahead of us (excellent idea, they were the bait for any gators up ahead so we could then assess whether it was safe for us) and we hardly saw anyone else for the whole ride. We picked a good time because, of the numerous gators we saw, most were sleeping and/or just not interested in bothering us as long as we didn’t bother them. There are very few safety signs in the parks about them; mainly you are just advised to stay ten feet away and not to feed them, whereas in bear territory there are way more signs telling you exactly what to do to avoid a bear attack. So we weren’t too worried. Plus at the start of our ride, all the alligators were on the opposite side of the river bank – only about five feet away, but still, we felt like we’d have a headstart if one of them decided to come over and say hello. Pretty soon, we started seeing more on our side of the river, but by this point we were getting used to them and the fact that the most movement they were going to make was to slowly open one eye. Then up ahead we spotted one gently ambling across the path we needed to take. We weren’t sure what to do, but the two people ahead of us had just cycled past it without incident, so we decided it was better to do that than to hang around. It’s very difficult to give an alligator a wide berth when then path is only about fifteen feet wide anyway. And did you know they can apparently run at speeds of up to 11 mph? However, it’s amazing how fast you can cycle on a rusty, gearless bike when you need to! Halfway around the trail, we stopped at a lookout point and got an amazing birds-eye view of the gators swimming in the waters below, as they were just all starting to wake up and move about. At this point, they really looked like Disney animatronics and we did have to keep reminding ourselves that they were real. We also had a slight worry that there might be one lying close to our bikes when we returned to where we had left them at ground level, and decided that our best course of action would be to go back up the lookout point and wait for it to get up and move on …. however long that took. Thankfully, this problem did not materialise. The second half of the trail was away from the waterway and in more kind of open country. Every few feet there were little ponds and every one had a small alligator lying in it. We also saw a congregation of tiny baby alligators, who were utterly adorable, but their doting mother was just a little more scary. We did not hang around there. By the end of the trail, we had seen so many alligators that it was like “oh yeah, ANOTHER one ….”. They were amazing though, very prehistoric-looking and almost too strange to be real. It was so nice to see them in their natural habitat instead of at one of the horrible places where they are kept in captivity and forced to wrestle with the people who run it. The rest of our week in the Florida Keys was pretty much spent relaxing poolside, although we did have a trip through the Keys to see some of the islands, as well as getting in a few short runs around the local golf course which, of course, warned that alligators might be hiding out there. 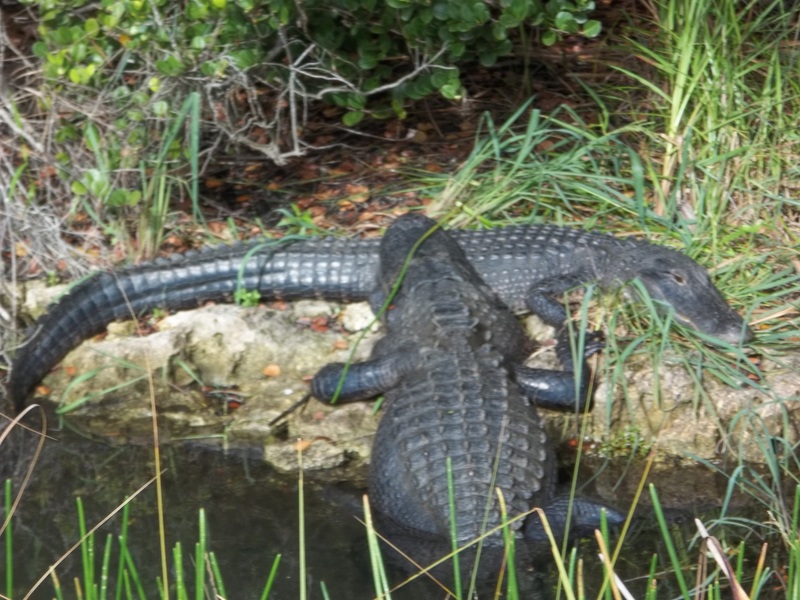 But hey, we were alligator experts by this time…. ….None for ages and then three come along at once. This month has been a bit of a 5K frenzy for me. First I ran the ODU Big Blue 5K, which I had also run last year. It was another awesome day out. Last year I finished it in 28:17. This year I managed to knock off over two minutes, to finish in a time of 26:13. I finished 6th in my age group, 68th female overall and 294 overall, out of 2091. I was really pleased with my progress over the past twelve months, but a little grumpy that I still couldn’t get a finish time with a 25 at the start of it (even with a 59 at the end). 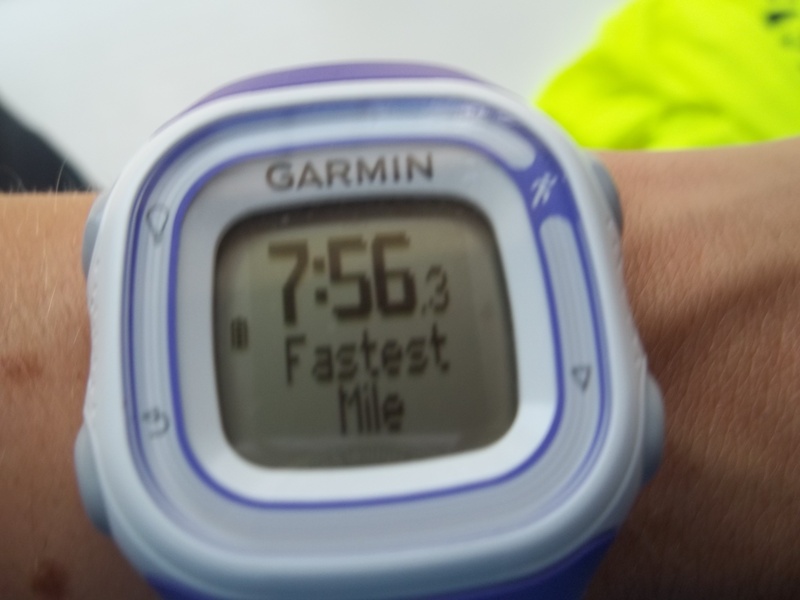 I had been gradually improving my times but still couldn’t quite get there. Next up I ran the Surf’s Up 5K along the oceanfront, this time as part of a team. The conditions were perfect on the day. I dispensed with my usual logic and tactics of trying to pace myself, and just decided to run as fast as I comfortably could for the whole race, to see what I could do. Well, I managed to finish in 25:35! I impressed myself, but also kind of annoyed myself because I had improved so much since the ODU race that I thought I had peaked and now had nowhere else to go. 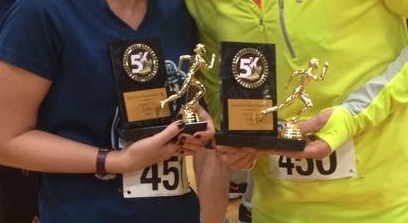 I got 3rd place in my age group, and my team won 2nd place overall for our combined performance! and I decided that I didn’t care how well I ran the rest of the race, I was just so happy to finally run a sub-eight minute mile 🙂 In the past I have only occasionally managed an 8:06 (my previous best time) or slightly slower pace and that is only when I’m running one mile and then stopping. Well, my average pace for the whole race today was around 8:06. That’s right, not just one but three-and-a-bit miles at that pace! So you can work out that I did actually manage to break my own 5K record today – with a finish of 24:58!! I never thought I would ever actually see a 24 at the start of my time. I came 3rd in my age group (third again!! Even having taken four minutes off my 5K time since my first trophy last year, I still can’t get 2nd place!). I’m quite pleased that I have no more 5K races for a little while now. The heat and humidity is just starting to increase here so my times will be ever increasing from now until about September. Plus I have to concentrate more on my longer distances now, as I have a 10 miler, 10 K and Half Marathon to compete in very soon….. I was looking forward to Shamrock 2015 because last year’s event was the first large organised race event that I had run. This year, not only did I already know what to expect, but I had the opportunity to see how much progress I had made in the last twelve months and to see whether I could improve on my finish time. So I ran the 8K race. Last year’s finish time was 48:29, and I finished 146th in my age group and 2200th overall. This year I finished in 44:34, almost four minutes faster 🙂 . I finished 51st in my age group and 1416th overall. So I’m very happy with those results! Meanwhile Stateside Husband went one better. Not only did he run the 8K on the Saturday (very graciously slowing down to keep pace with me) but he went on to run the half marathon on the Sunday too, thus completing the Dolphin Challenge. Oh, and did I mention that he finished the half marathon in 1 hour 34 minutes? I got a bit caught up in all the excitement of race weekend and somehow managed to sign myself up for two half-marathons for this year. One in May (so I’m fully into the training now, with a couple of 8 mile runs under my belt), and another at the end of November, so I can restart serious training after the heat and humidity of summer have gone. I’m not going to be quite as fast as the husband, and he has promised to pace me again as this will be the furthest distance I have ever run! I’ve been really happy with my progress over shorter distances, having recently broken my own records for 1 mile, 5k and 8k distances, so it’ll be a new challenge to slow my pace down and go long distance instead. More bling in the Stateside household!! Stateside Husband and I both recently took part in the March Madness 5K which is a free race held near our home. Back in November I won my first ever trophy (3rd place in my age group) at its sister event, the Veterans Day 5K. Meanwhile, Stateside Husband participated in last year’s March Mania and brought home the trophy for first place in his age group. So we had a little hope that at least one of us might win something again although we didn’t want to ruin our enjoyment of the race by thinking about our pace. Well, as you can see from the photo, we were successful! I achieved third place in my age group again, this time with a time of about 26:42 (I’m not exactly sure because they don’t release the official times and I forgot to stop my timer for a few seconds). I think it was a new record for me! Meanwhile Stateside Husband retained his title, first place in his age group and fifth place overall. Celebrations all round!! Yet more snow here, which isn’t that terrible but bad enough to curtail most outside activity (well, running, mainly). However, I have achieved two more milestones this week. First, I finally ran the equivalent of here to Boston – 920km – which was the last place on my list when I started setting myself targets last year. It’s only taken me 14 months to get there! So now I need to shoot for the full 1000km (only just over 57km to go as of today). Secondly, today I ran my fastest mile ever, in 8 minutes 21 seconds 😀 I should say that this was on the treadmill and with the knowledge that I was going to stop after that mile, so I don’t expect to be repeating the feat in a longer race at any time. I also probably shouldn’t have then gone straight into a Chisel class with a huge emphasis on legwork, but hey ho. I can still walk at the moment. So I am feeling quite accomplished. I think I have earned the new running shoes that should be arriving here tomorrow. For the first time I have bought a second pair of the same shoes, because they are THAT good. They are the Saucony Virrata 2, which are spectacular because of the zero heel drop which gives a more natural running position (or summat like that, I almost sound like I know what I’m talking about don’t I?). Anyway, the first pair have been awesome so far, and despite not needing a new pair just yet they were on sale so I’m buying them as a little celebration of my recent achievements and putting them away until I really need them. I also bought the Oh She Glows cookbook as it was so good. 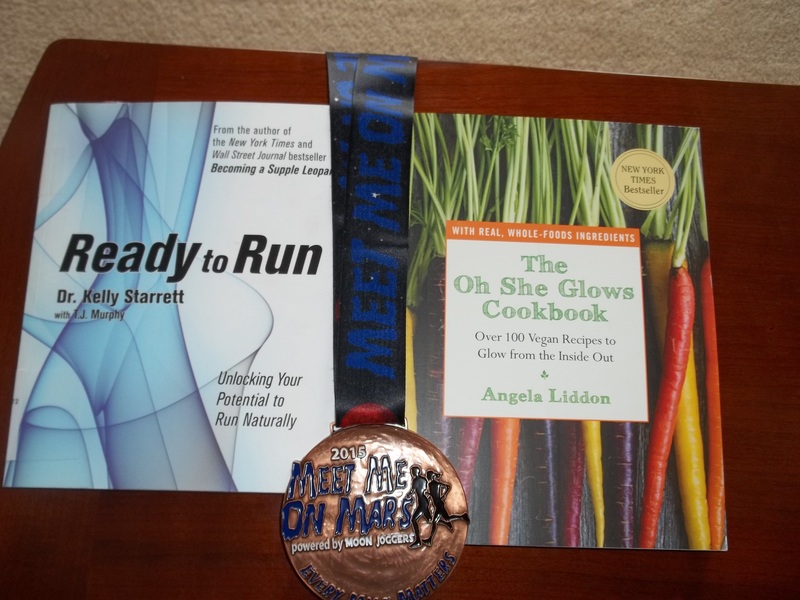 Other finds from the library during my snowbound hibernation have included Ready to Run by Kelly Starrett and Eat & Run by Scott Jurek, both of which I picked up on a bit of a whim but have found surprisingly enjoyable. Ready to Run is not really about running but more about mobility and stretching to fix all sorts of niggly aches and pains and to therefore improve one’s running as a result. It’s also very enlightening for anybody who is deskbound and hunched over a computer all day, which I hope not to be but expect I will be again by this time next year. Eat & Run is a memoir by a guy who is an ultramarathoner and a vegan, but in truth I don’t think it would matter what the subject was, he just sounds like a nice chap and writes so well that I’d probably enjoy reading the phone book if he’d written it. It is so heavy, I’m not quite sure where to hang it yet, as I think it will pull down anything I try to put it on. Something for me to consider during the next round of snowfall then. Day five of an unexpectedly extended weekend due to snow, ice and historic low temperatures for these parts. We don’t have it quite as bad as Boston, but the state has been paralysed, with all local schools and a large number of businesses closed. The enforced hibernation has been pretty positive here at Stateside Towers. I have been kept inside and driven to use Satan’s Hamster Wheel (the lovely treadmill) for a couple of days, which in itself is depressing and usually demotivating, however I used the opportunity to measure my pace accurately and push myself further for a few stretches during my run, resulting in a new 5K personal best of 27:10, knocking more than a minute off my previous record. Go me!! I don’t think I‘ll be repeating that time again easily as I needed somewhat of a lie down after it. I usually use my weekdays as an opportunity to try out odd and adventurous new recipes when there is only me to poison. Stateside Husband has been at home with me this week so he has been subjected to all my experiments (and there have been a lot, as I have been trying out recipes from a cookbook I borrowed from the library that has to be returned in two days). We were both pleasantly surprised to find that he enjoyed all the recipes, I didn’t poison either of us, and we now have a selection of new breakfast, lunches and dinners to add to our menu. Needless to say, I am going to buy the recipe book now. In other news, I’ve signed up for a number of races this year so I now have twelve months of events to train towards. As well as repeating the same races from last year, I’ve added a few new ones in to keep it interesting. I’ve also signed up to Meet Me on Mars, which is a virtual race where everyone’s mileage is tallied up and the goal is, not surprisingly, to run all the way to Mars. I had an amazing start in January, running 75 miles towards my original 2015 goal of 500. Meet Me on Mars is giving me even more motivation to keep up with my mileage throughout the year, although I expect my monthly totals will get lower as the weather gets warmer (which is hard to imagine right now…). So the weather outside may be frightful but my plans for the year are quite delightful. A stranger asked me today whether I am a runner. I thought about it for a few seconds. I’ve made it to the end of a number of races over the past eighteen months, in not too shabby finish times, but there are a lot of people a lot faster than me. I’ve recently got to know a bunch of people who frequently complete 50km ultramarathons and triathlons in spectacular times. Next to them, I feel like a bit of a fraud, like I’m not really doing it properly. Then I thought back over the past twelve months, and the fact that I covered a total of 460 miles according to my tracker. Not bad really. My goal for 2015 is to get to 500 miles. Also, just before this conversation with the stranger, I had covered six miles under my own steam in an hour. That’s actually pretty impressive for anyone to do. 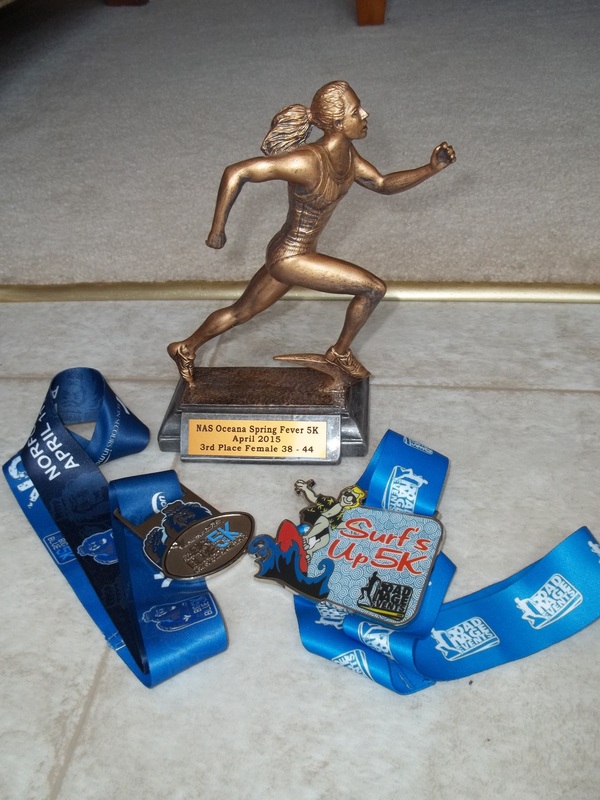 So, yeah, I am a runner. Thanks for making me realise and accept that today, stranger. My last competitive run of the year and I hadn’t done much running for a few weeks due to our Thanksgiving break and some generally crappy weather, however I hadn’t bargained on the power of cold weather and the promise of free beer for improving one’s speed on race day. The Surf n Santa is a five mile jaunt along the oceanfront and through the Christmas lights, with participants dressed in their best festive fancy dress. I was an elf, pursued for much of the race by The Grinch. I’m pleased to say I put in one of my best results (I thought it was a personal record but apparently I managed a similar time once before, go me!). My overall time was 46:52, putting me 972 out of 4208 participants, 57th of 428 in my age group, and 410th of 2736 females. And I got several free pints of Winter Lager for my efforts at a cracking Christmas party afterwards! 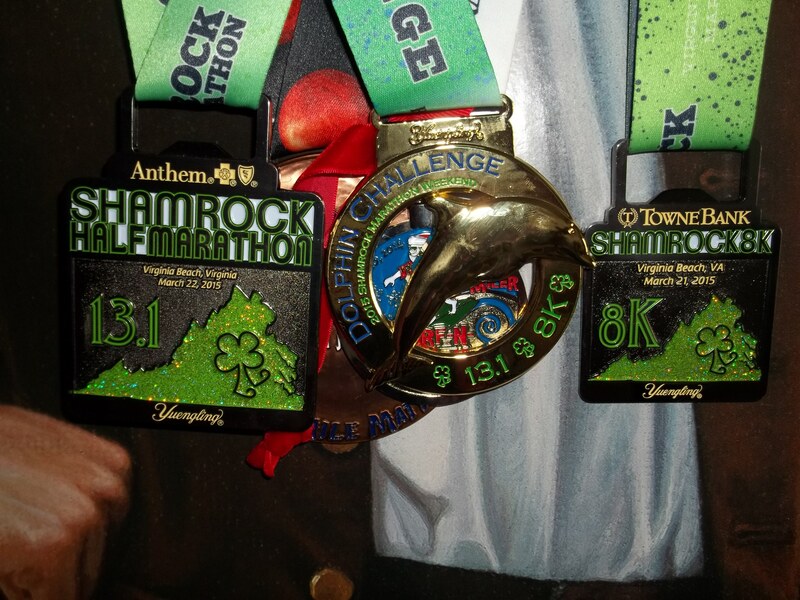 Now hanging up my competitive running shoes until my second go at the Shamrock 8K in March – and also hanging my Surf N Santa medal on the Christmas tree!